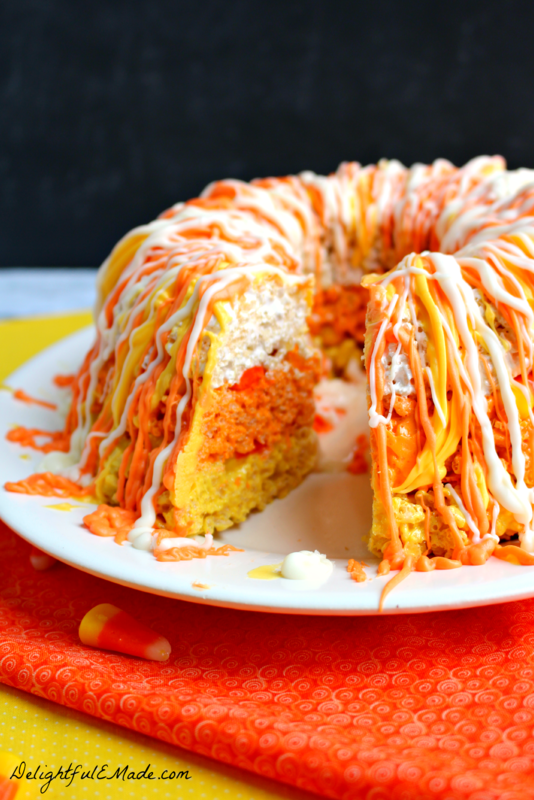 If you love to munch on candy corn or if you enjoy the classic rice krispie treat, you’ll love this Candy Corn Krispie Cake. 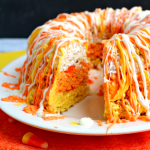 Its layered to look like candy corn and drizzled with candy melts, its the perfect fall treat! Do you love candy corn? 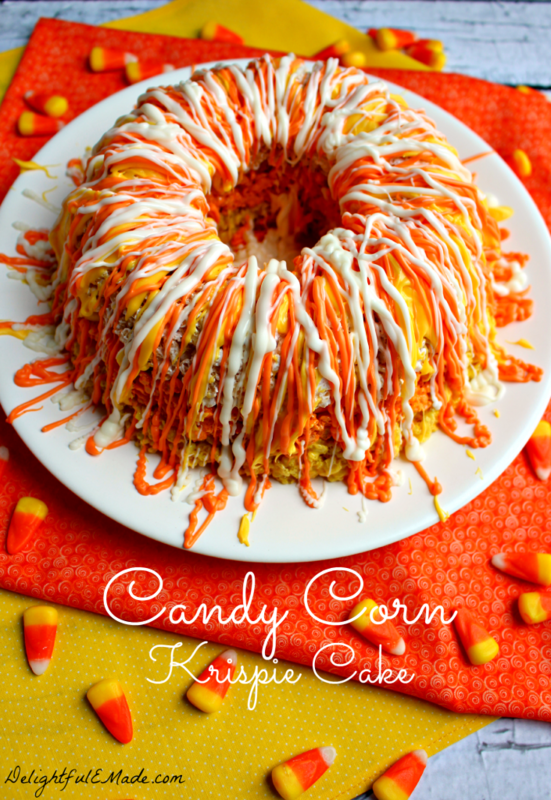 Candy corn is one of my son’s favorite candies, so since we had a few days off school, I wanted to surprise him with this fun Candy Corn Krispie Cake. I created this fun, easy-to-make treat by simply adapting the standard rice krispie treat recipe that comes on the side of the cereal box. If you enjoy the classic rice krispie treats, you’ll love this!! 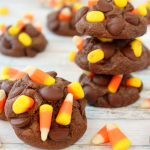 Making this fun treat takes just a few simple steps, and simple ingredients that you’ll have in your pantry. 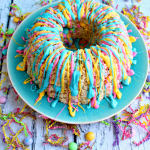 You will utilize a bundt pan and layer the rice krispie treat recipe into thirds. To make the top portion white, I simply added marshmallow fluff to the rice krispie treat recipe, and topped with candy corn. 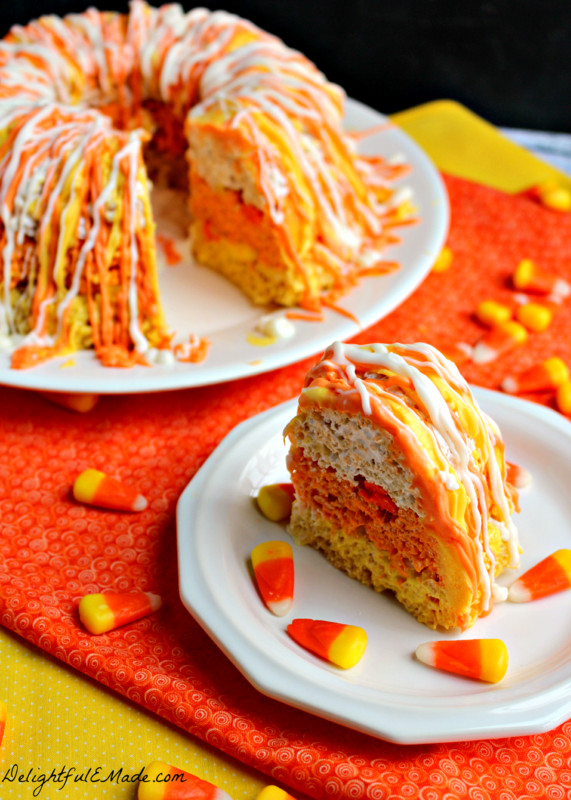 The second layer is the standard rice krispie treat recipe, colored with orange food coloring in the melted marshmallow, and also topped with candy corn. The third and final layer is the rice krispie treat with yellow food coloring added to the melted marshmallow. The end result, is a pretty layered rice krispie treat with candy corn nestled into the middle layers! 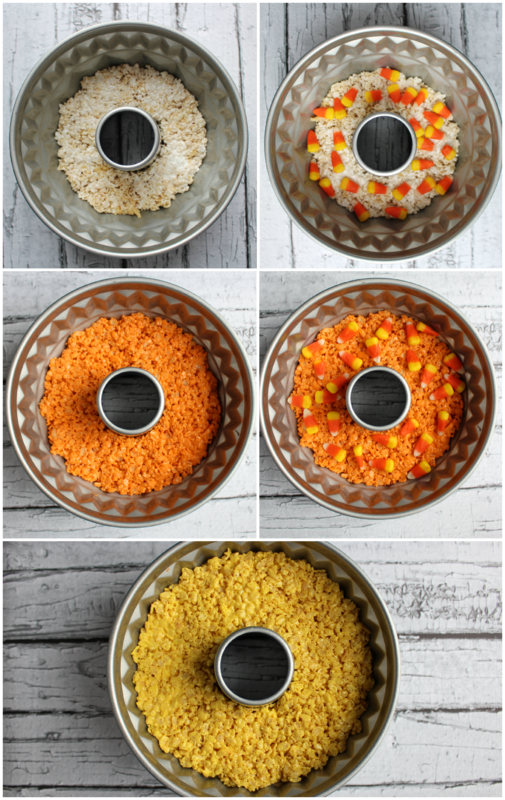 Once the layers are complete, you’ll simply invert the bundt pan onto a plate, and your rice krispie cake will come out beautifully. I enjoyed making this treat even prettier by drizzling white, yellow and orange candy melts on the top of the cake. 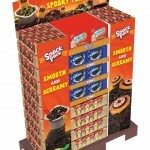 (You can purchase just about any color of candy melt you can think of at any Michaels craft store, or online.) Not only do the candy melts look amazing on top of the cake, they taste pretty fantastic, too! Don’t those layers look pretty? I was really happy with how it turned out, and was Harrison and the rest of our neighborhood friends that we shared it with. As soon as I brought the cake outside to share with our friends, both kids and grown-ups couldn’t take their eyes (or their fingers) off the cake. Needless to say, it was a huge hit, and gone in a matter of moments! 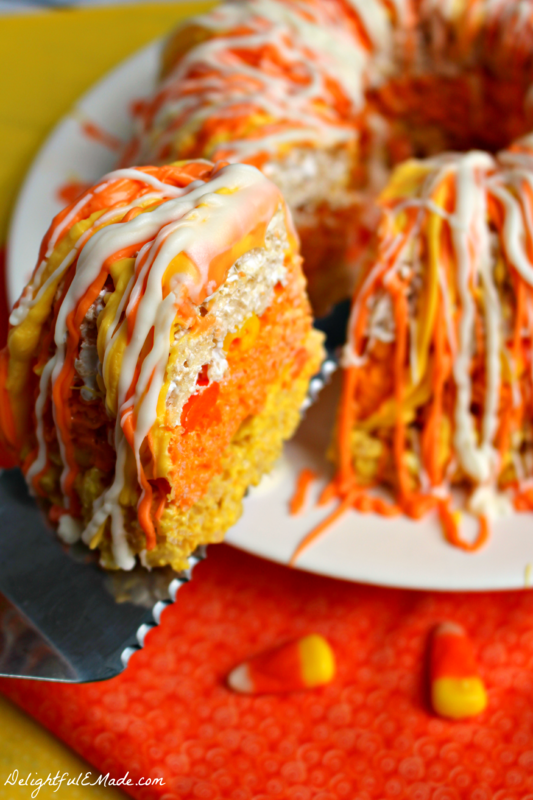 If you like candy corn and rice krispie treats, you'll love this!! 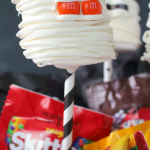 Layered to look like candy corn, and drizzled with candy melts, its the perfect fall treat! With non-stick cooking spray, spray the inside of a bundt or tube pan. Set aside. In a medium microwave safe bowl, melt one Tbsp. butter, add 1c. marshmallows to the melted butter, and stir. Melt the marshmallows for about 30 seconds on medium heat. Add 2 c. cereal to the melted marshmallows and stir well. Add the 2 large spoonfuls of the marshmallow fluff, and stir thoroughly. Lightly spray your hands with non-stick spray. Using your hands, firmly press the white cereal mixture into the bottom of the bundt pan. Add 1/2 cup of the candy corn to the top of the white cereal mixture. For the second layer, melt another tablespoon of butter in a microwave safe bowl. Add two cups of marshmallows, and stir. Melt on medium power for 30-45 seconds. Stir the melted marshmallows, and add several drops of the orange food coloring. Add 2 cups of cereal and stir thoroughly. Spray hands and firmly press the orange mixture onto the top of the white mixture. Add the remaining 1/2 cup of candy corn to the top of the orange layer. For the third layer, melt the last tablespoon of butter in a microwave safe bowl. Add two cups of marshmallows, and stir. Melt on medium power for 30-45 seconds. Stir the melted marshmallows, and add several drops of the yellow food coloring. Add 2 cups of cereal and stir thoroughly. Spray hands and firmly press the yellow mixture onto the top of the orange mixture. Let the pan set for a few minutes to cool. Invert the pan onto a plate, and the cake will come right out. Melt each of the three candy melt colors in their own bowls. (Follow the label on the candy melts for proper melting directions.) Drizzle the cake with each of the candy melts, and let set before serving. I hope you get to enjoy this krispie cake as much as we have. 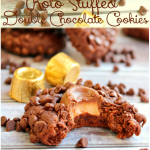 It makes such a fantastic party food, a fun bake sale treat or just something tasty to surprise your family with. My son Harrison was certainly surprised with this fun cake. Not only did it bring Harrison joy, but our friends and neighbors got to enjoy it as well. 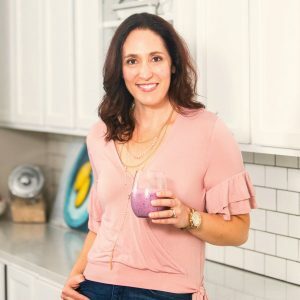 I just LOVE this, Erin! This is crazy fun. :) Pinned and sharing. Thanks so much, Carrie! You're so sweet! This is such a genius idea. I love the different colours, and the use of a cake pan, and all of that goodness drizzled on top. Pinned! Love this fantastic dessert! Newest follower from the Freedom Hop. 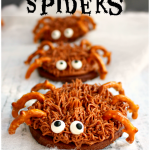 That looks SO festive and fun, and I need to make it asap!!! Saw it on the round up by Tatertots and Jello! P.S. I realized I have all the ingredients and making it tomorrow! Oh Yum! That looks amazing! I love all the bright colors! Pinned it. Oh this cake is super cool, Erin! I used to hate candy corn, then I only liked it in baked goods. Now I'm starting to like it solo! Oh my gosh! This is so darn cute! Love it!